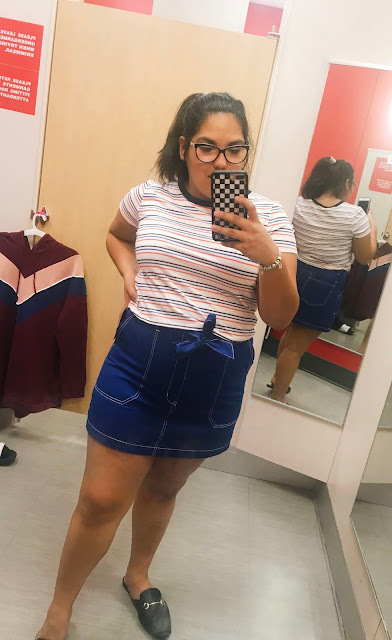 Inside The Dressing Room With Kass: Is Target's New Brand "Wild Fable" Really Curvy Friendly? Today I am so excited to take you into the dressing room with me to uncover the behind the scenes of the plus-size world in a dressing room. Many people do not understand the struggles or the imbalance of sizing when it comes to Plus Size shopping. In today's post, I visited Target and checked out the newest brand that everyone has been talking about: Wild Fable. 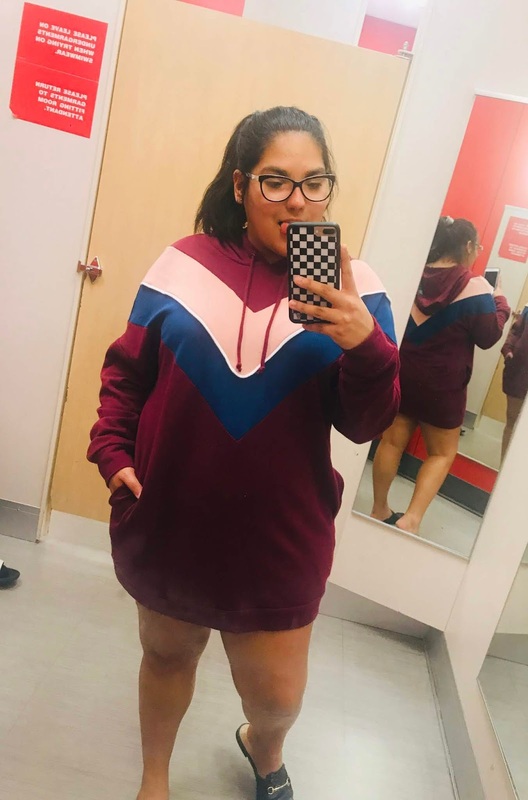 Though this brand has a separate plus size section, most of the pieces aren't sold in stores and the clothing material is still the same as it is for the regular sizes. This brand is also catered to "young adults" which is also something to think about when seeing how each piece looks and fits. As a previous Target shopper, I already know that none of their brands are true to size and I have to go at least a size up. However, my regular sizing consists of the following: Tops: XL or 2XL, Jeans: 14 or 16 Short, Dresses: 14 or 16, Shoes: 10. Now let's see all the pieces I tried on that vary from school looks to a day of shopping! This is the first look! For this outfit, I combined a white half tee (XXL) and put it under a zip-up cheetah dress (XXL). For the half tee, I loved the fit and it covered up all my chest area. It is a perfect staple piece to spice up a dress or romper. The cheetah zip up dress was also one of my favorite things I tried on. It was made out of a corduroy material but was very form fitting. I liked the way this dress fit my curves and didn't make me look that wide. I would totally buy this outfit and it is Curvy Approved! This second look has to be an essential in every girl's closet. For me personally, I love this look because I can never buy hoodies and wear them as a dress because they are always too short. The idea of just making a hoodie dress is amazing because it is cute and comfortable. The size I grabbed for this dress was an XXL and I think it is just right. This dress is not available for the plus size section and only goes up to an XXL which is not quite a 2XL. I would totally buy this outfit and it is Curvy Approved! For this third outfit, I am surprised that I did not break this skirt. I am a huge fan of skirts but lately, it has been difficult to find ones that fit right. Clearly, the skirt is too small but it was in the biggest size which is 18!! This skirt isn't available in the plus size section and I mean it shouldn't be. The skirt's material was awful and is not flattering or comfortable for curves. The cropped shirt (XXL) was made out of a soft material and I would most likely buy just the top. This outfit is not curvy approved! This fourth outfit has to be my least favorite. The concept of a matching set is always nice on the hanger but when it comes to putting it on my body it is usually different. The cropped hoodie (XXL) is really nice and lightweight for Florida weather but I would never match it with the pants that I did. These windbreaker pants (L) are just not comfortable or flattering at all. I did go two sizes down because they run so big out they are just not flattering for my body type. However, if you like a nice loose and boxy fit these pants could be for you. Both of these clothing items are also not available in the plus size section. This outfit is curvy approved but not for me! This final outfit is one that I have a love and hate relationship with. Starting with the crop top (XXL) it's a big no. The picture does the top justice but in reality, it is so see-through and with my bigger breasts it makes the shirt look like dollar tree quality. The top is a great length, however, the material is too cheap to be sold for more than $5. The jeans (18) on the other hand are an amazing fit. I had to go up to the largest size (18) but they are a good high-rise length and remind me of a pair I have from American Eagle for half the price. The jeans are curvy approved but the top is not. They do have the top in the plus-size section but I don't know if that would have made a difference since the material was the problem. That is a wrap for my time in the dressing room and I hope you guys like it! If you have any experiences with Wild Fable and how they fit your curves then feel free to comment that down below. If you liked this Inside The Dressing Room With Kass post and would like me to do more then comment other stores or brands I should try out! P.S. This post is not sponsored so all my raw opinions and thoughts are truthful!